This week we celebrated a people’s victory! 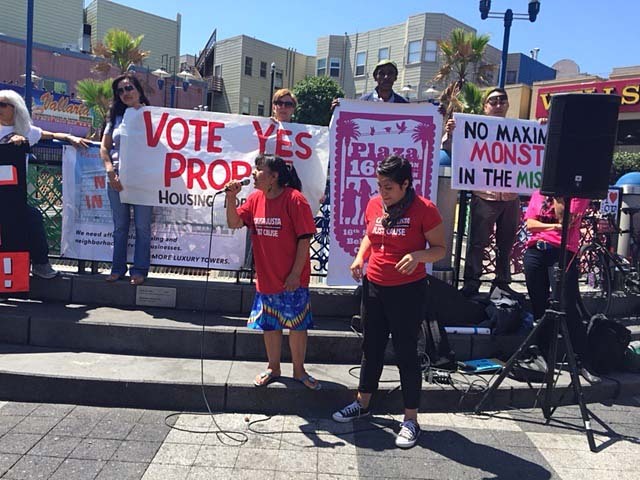 Plaza 16 Coalition leaders are crediting community activism for development turmoil between Monster in the Mission developer, Maximus Real Estate Partners, and the Jang Family Trust, owners of the 16th and Mission property. With the apparent collapse of the project, the Coalition is demanding that the City now purchase the 1979 Mission Street property for the development of affordable housing. A broad coalition of grassroots organizations, working class residents, and local businesses have fiercely contested the Monster in the Mission, the 331-unit high-end development project slated for 1979 Mission St. The news of a lawsuit filed by Maximus against the Jang Family Trust comes at a moment when soaring rents, increasing evictions, and an onslaught of high-end housing has ignited a grassroots protest movement in the Mission District targeting high-end real estate speculators, greedy landlords, and pay-to-play City officials. Plaza 16 says the apparent break in the purchase agreement opens up an opportunity for the City to be aggressive in meeting its housing balance obligations for the Mission District by purchasing the site and developing 100% affordable housing. It was through the activism of residents, community groups that the City was able to recently step in and purchase a nearby privately-owned site at 490 South Van Ness for the purpose of developing 72 affordable apartments. Plaza 16 insists the City can and should do the same for this property. This apparent victory is part of a growing grassroots movement spreading across the City resulting in development and evictions battles in SOMA, Western Addition, Chinatown, and the Mission. As well as this November’s election which includes Prop I- Save The Mission, Prop F- Short-term rental regulation, and Prop K- surplus city lands for affordable housing.